Monday, 31st. This morning about 10 o’clock we met six wagons with 18 men, with fur and robes on their way from Ft. Larimie [sic] to St. Louis. Ft. Larimie is situated on Larimie’s fork near its junction with the N. fork of Platte, and is about 800 miles from Independence. [So their guide, Thomas Fitzpatrick, must have told Bidwell.] The wagons were drawn by oxen and mules–the former looked as though they received a thousand lashes every day of their existence! The rusty mountaineers looked as though they never had seen razor, water, soap, or brush. It was very warm, and we travelled till dark before we were able to reach water, and then it was not fit to drink, and then we could not procure any wood, grass scarce. The company had left the Kansas River and traveled up the Little Blue, and at this date were situated just beyond the source of the Little Blue and not yet at the Platte River, which they would follow until they reached Ft. Laramie. 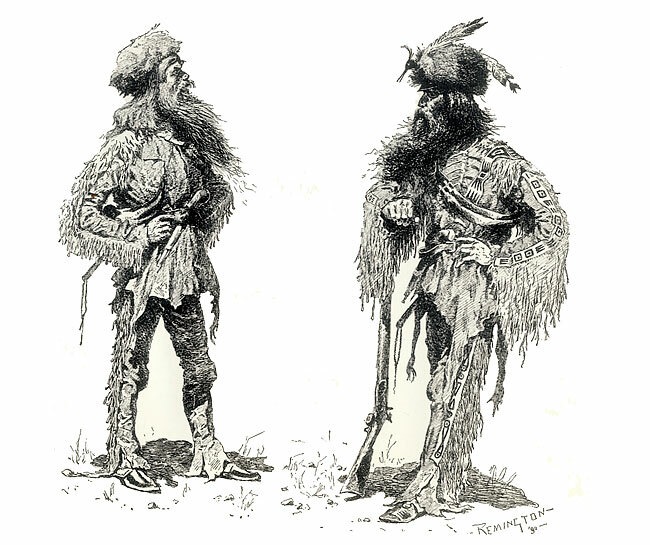 The “rusty mountaineers” that Bidwell’s group met were working for one of the fur-trading companies that flourished in the western territories during the first half of the 19th century. St. Louis was the marketplace and supply point for the fur traders and mountain men, and from that point the buffalo robes and beaver pelts were shipped to the East Coast and Europe.